The six opening fixtures in the Betfred Super League attracted nearly 57,000 supporters - figures which will have pleased the powers-that-be as they strive to give the sport a seat at the top table. 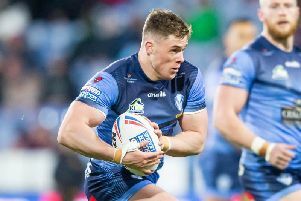 Not surprisingly, the Saints-Wigan Warriors derby at the Totally Wicked Stadium on Thursday night drew the biggest crowd with 16,508 fans flocking through the turnstiles. The following night's Humberside derby at Craven Park pulled-in 12,100 followers and Saturday's Battle of the Rose between Warrington Wolves and Leeds Rhinos was attended by 13,098 spectators. All five-figure attendances and a positive sign that Super League is now going in the right direction under the guidance of chief executive Robert Elstone and his back-up team. The three other fixtures, Castleford Tigers v Catalans Dragons (7,494), Huddersfield Giants v Salford Red Devils (5,387) and London Broncos v Wakefield Trinity (2,149), produced turn outs more or less as expected but if the club from the capital can regularly produce match-winning performances like they did against the Belle Vue boys it can only be good for the game in general. St Helens coach Justin Holbrook said:'' Super League have done a great job in opening up the game and it is something I felt right from the moment I attended the official launch at Old Trafford. ''The fans have been itching for the season to start and came out in big numbers.